Free Coaching for Forest Range/ Section/ Beat Officers in Forest Department 2017/ TS SC Study Circle TSPSC Forest Department Recruitments Free Coaching 2017-2018: TSPSC Forest Department Recruitments Free Coaching 2017, TSPSC Forest Beat Officers Recruitment Free Coaching 2017, TSPSC Forest Range Officers Recruitment Free Coaching 2017, TSPSC Forest Section Officers Recruitment Free Coaching 2017, Free Coaching for FBOs, FROs, FSOs Recruitment Exam 2017, Apply online TS SC Study Circle Free for TSPSC Jobs Recruitment exam 2017 at http://studycircle.cgg.gov.in/tssw/Index.do, TS SC Study Circle Free Coaching Program for Forest Department Recruitments Exam 2018 for SC/ST/BC and Minority Candidates. Free facilities, Eligibility Criteria, Online Application Form submission Last Date, Hall Tickets, Results, Qualification, Selection Procedure, Reservation, Common Screening Test 2018 Date, TS SC Study Circle Admission Notification 2018 Admissions Counseling Dates Telangana SC Study Circles Details at official website. Telangana SC Study Circle TSPSC Forest Department Recruitments Free Coaching 2017-2018 admission notification/TS SC Study Circles Free Coaching for Forest Range/ Section/ Beat Officers Recruitment 2017:The Schedule Castes Development department is dedicated to the integrated and overall development of SC's. The Telangana State Government, SC Welfare Department-TSSCW would given the notification for admission into the TSPSC Forest Department Recruitments free coaching program for FBOs, FROs, FSOs Recruitment Exam 2017 at its TS SC Study Circles. The TS SC Study Circle is going to invite online applications from eligible and interested SC, ST and OBC Candidates of Telangana state for admission into above said free Coaching program. 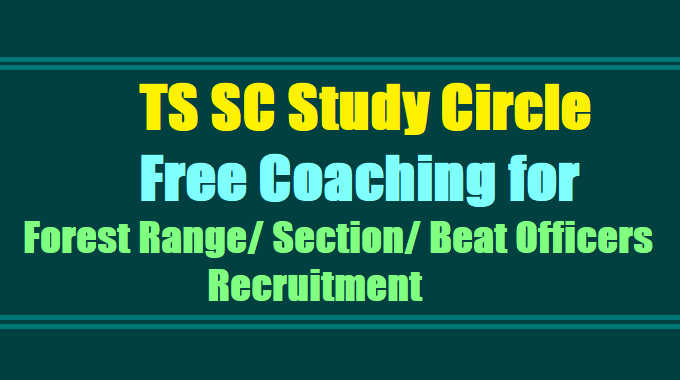 Free Coaching for Forest Range / Section / Beat Officers in Forest Department - 2017/ TS SC Study Circle Free Coaching for Forest Department Recruitments: The Free Forest Department Recruitments Coaching program 2017 for only Candidates who are in the category of of SC, ST, BC and for appearing the TSPSC FBOs, FROs, FSOs Recruitment Exam 2017. Telangana SC Study Circle is conducting this free coaching program for the weaker sections of above said who are not able to study in the private/corporate Training/Coaching Institutes which are very costly for them. This is a good opportunity for them, this is Free Coaching with all facilities for the selected Candidates.